As an omni – or even a straight-up vegetarian – potato salad was never high on my list of Things That Are Good. When I think “potato salad,” I imagine a bowl of sad-looking potatoes buried under mounds of gloopy, inexplicably yellow mayonnaise and squishy bits of egg. Inevitably, my mind places said salad on a picnic table piled high with at least two other varieties of disgustingly warm potato salad, all store-bought, because apparently that’s the extent to which some people are willing to contribute to a backyard barbecue. 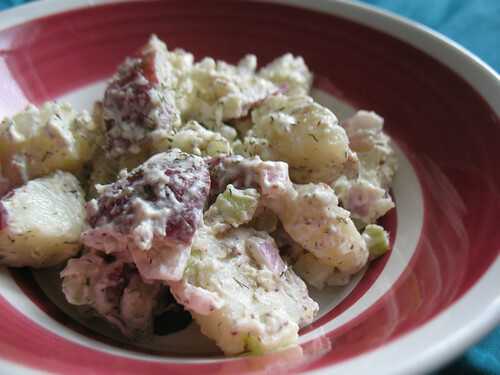 Aaanyway, the bottom line is that potato salad is not something I’ve ever had a burning desire to eat. Yeah, it’s weird, but a week or so ago, a truly bizarre potato salad craving punched me right in the gut and said, “Conquer your fears of the mayonnaise mess! You can do better than that!” And I listened. It probably had something to do with the jar of Vegenaise I’d purchased at Whole Foods a few days before the craving came to call. Unsurprisingly, I’d never cared much for “real” mayo, so I’ve never purchased vegan mayo. But it was on sale, and I knew I’d seen it used in some recipes I wanted to try, so I decided to give it a shot. With Vegenaise in the fridge and a bunch of red potatoes getting a little soft while sitting patiently in the cupboard, I knew I was well on my way towards conquering my tater salad aversion. But then I realized that I had no idea what the heck else went into a potato salad. Dill? Yeah, okay. But beyond that? No clue, dude. So I did my research on VegWeb, got some ideas, purchased a couple of items at the grocery store, and set out to make my own salad, unsure if I’d be able to eat it without imagining the unsavory salads of yore. When the potatoes were boiled and the ingredients were all mixed up, I gazed at the mixture with apprehension, unsure what monster I’d created. Sure, it looked a lot prettier than the nausea-inducing Platonic [not so]ideal of potato salad that I had in my mind, but would it taste better? I cautiously speared a bite-size tater chunk and gingerly took a small bite. In a second, all my tater hateration disappeared. This shiz is g to-the-double-o d! Holy crap! It’s amazing how actually being able to taste flavors beyond just mayonnaise makes this like 1000x times better. Good gracious. *I’m pretty sure that, at one point or another, my mom – who’s no fan of mayo – has made a potato salad that wasn’t disgusting, so I may have exaggerated here. Artistic license? Sorry, Mom (not that you’re reading)! I am in total agreement here. I was always really grossed out by mayo before I went vegan, but I LOVE Vegenaise. The stuff is dangerously good.